It is no secret that there is a damaged relationship between our country's law enforcement and the communities we serve. My mission is to help rebuild this extremely important relationship, starting with the most important citizens… our children. To this end, I started the Basketball Cop Foundation, which achieve 501c3 status a non-profit organization under IRS EIN #81-2039399 last year. 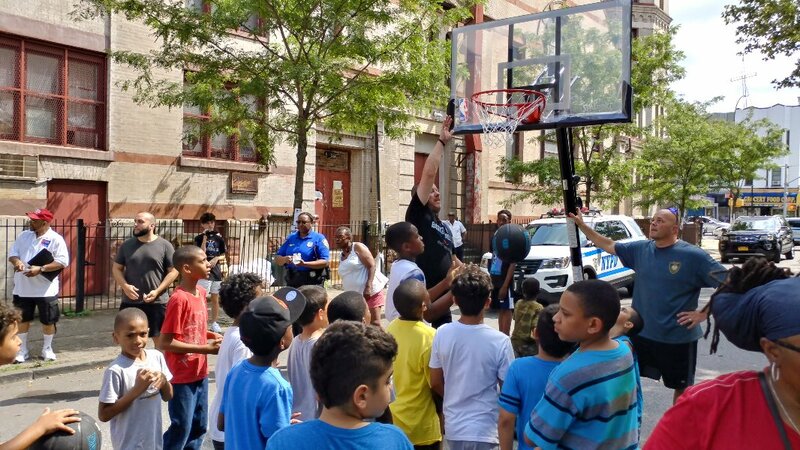 Our goal is to create inexpensive, repeatable ways for the police to build a relationship with their community through the simple connections built on a local basketball court. Because of a connection I made with Tyree through playing basketball together, he now texts me regularly, and I got to help him learn how to drive! My hope, and the Basketball Cop Foundation’s mission, is that more police and kids will be able to build a relationship like this. Our Hoops Across America initiative is the main way we give police agencies an opportunity to establish these relationships. We’ve started out in Gainesville, FL, where I’m an active duty officer. 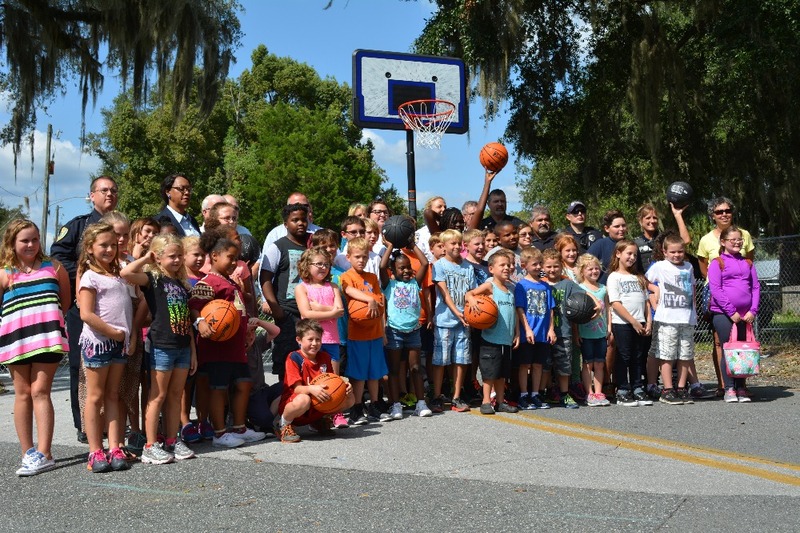 In our town, the foundation has donated countless basketball hoops locally and has built three outdoor basketball courts. 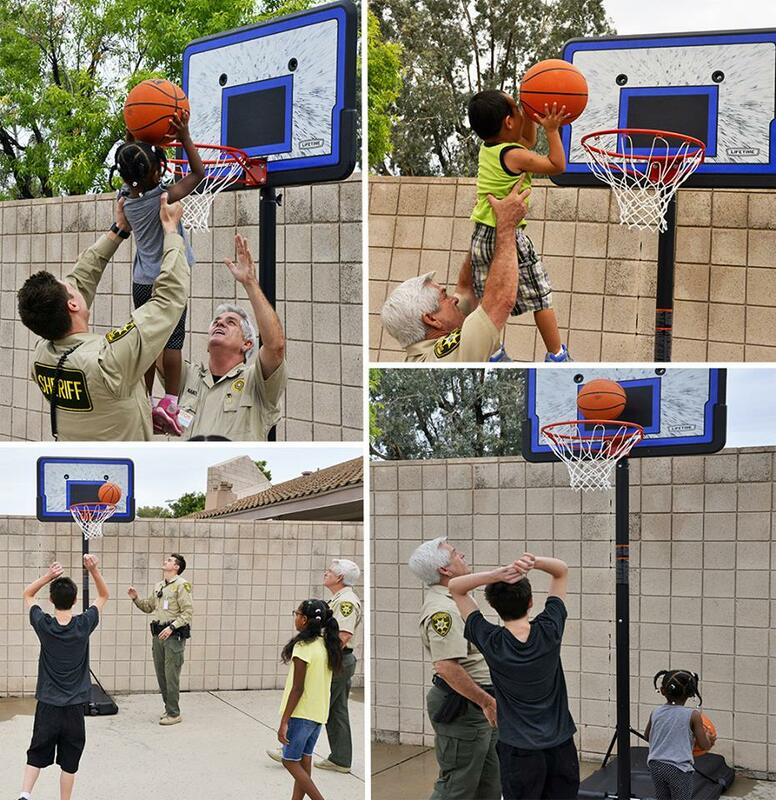 These courts give kids a safe place to play with each other and also with local police! These simple, inexpensive initiatives create opportunities for cultivating off-duty relationships between police officers and those in their community. 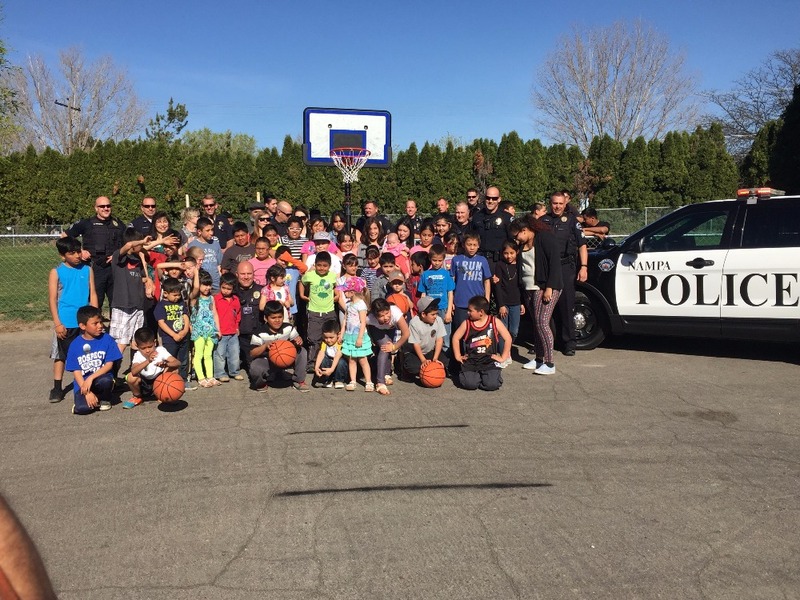 Within the last year, the foundation has supplied over 30 basketball hoops and 100s of basketballs to 28 different police agencies across the country. 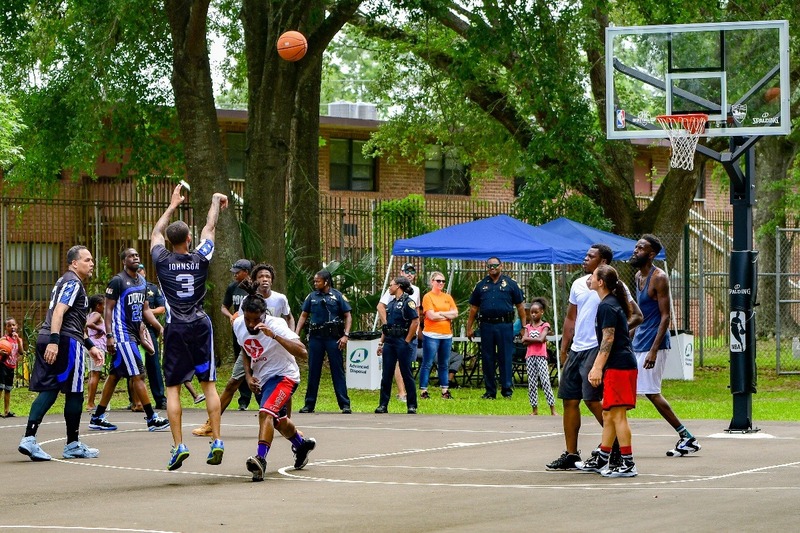 The recipient agency then creates an event which connects their local kids with the officers in a game of basketball. The agency then donates the basketball goal and the balls to the community. There are over 18,000 law enforcement agencies in the USA. The only thing preventing us from reaching them all is funding. As communities get connected with their local officers, extra side projects can develop for even more impact. For instance, in Gainesville, we initiated a backpack drive. 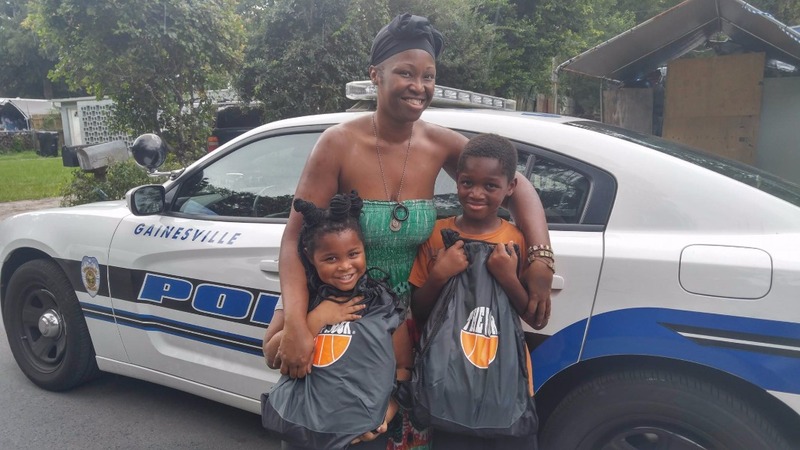 When an officer was chatting with a family involved in a minor car accident, it came up that the children didn’t yet have their school supplies for the upcoming school year. Our officer was able to pull two backpacks out of his car right then and there. That’s powerful. During the holiday season, I challenged my fellow officers to identify kids in the community who may go with little or no gifts for Christmas. They made lists, we collected donations for gifts, and the officers played Santa for a day. As we get more funding, we’ll be able to expand the Hoops Across America program to more cities. I hope to see a ‘Basketball Cop’ in every city as soon as possible. Do you know someone who could fill this role in your police department? I encourage you to challenge them to step up and try out taking ownership of a Basketball Cop project. 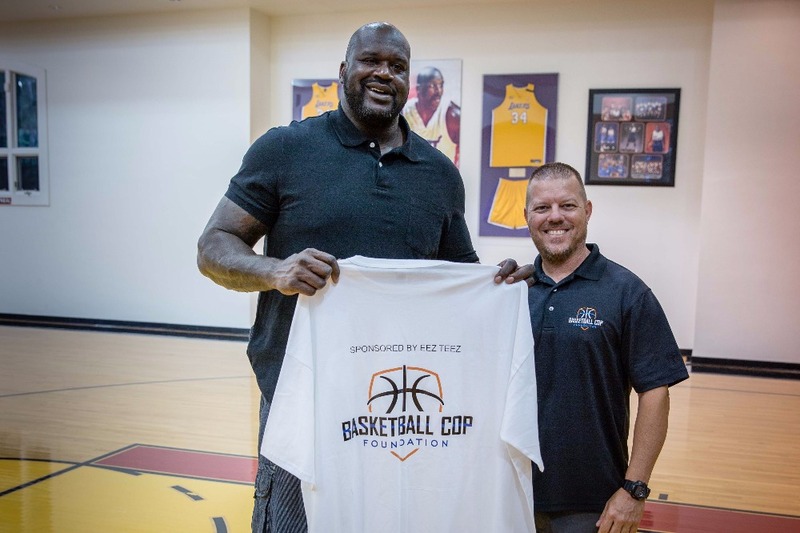 The future of the Basketball Cop Foundation relies 100% on YOUR donations. Because of our hard work thus far, we have gotten amazing opportunities to partner with the NBA and other great organizations, but we are completely funded by community crowdfunding. EVERY donation counts, regardless of amount. Check out our wish list for some estimated costs of our initiatives to see how you can make an impact! You can also reach me by email at basketballcop@gmail.com or by phone at 352-870-8608 with any questions. 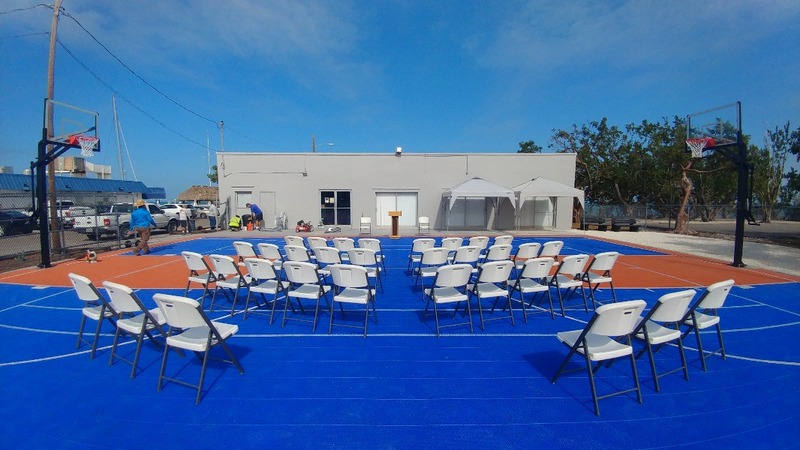 The BCF opened it's 4th basketball court! 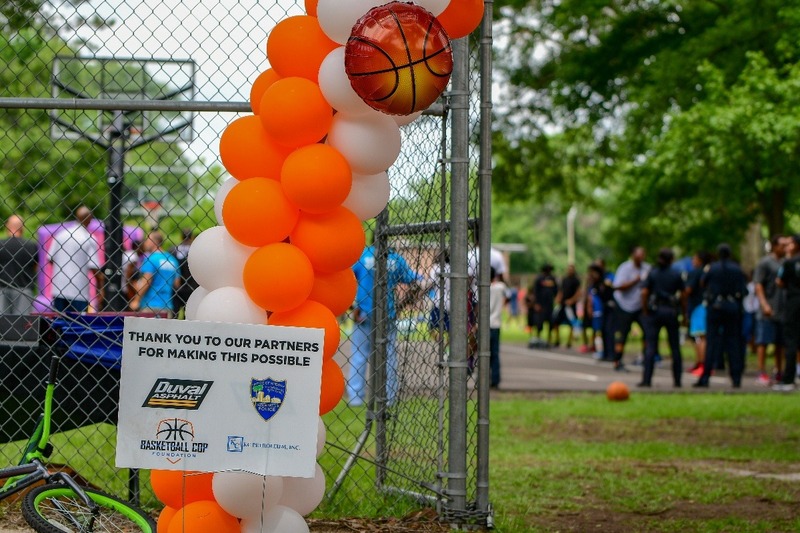 On June 9th, 2018, in partnership with Duval Asphalt and the Jacksonville Sheriff's Office, the BCF cut the ribbon on it's 4th community basketball court. This one is at the Celebration Church Dream Center in Jacksonville FL. This court replaced a 40 year old court which was in terrible condition. 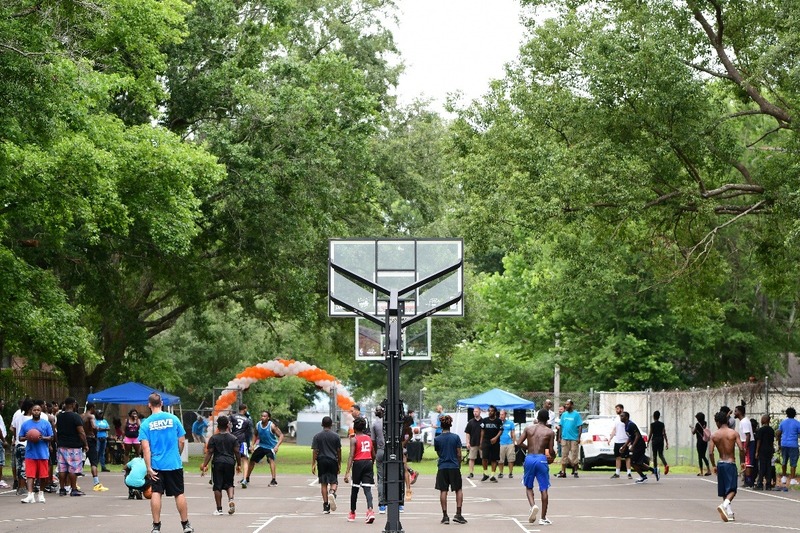 We opened up the court with a huge community event, connecting cops and the community on the new court. This court will continue to give the kids of Jacksonville's Cleveland Arms neighborhood a safe place to play for decades to come. Please consider a donation to help the BCF continue to improve police/youth/community relations nationwide!!! ***The Celebration Dream Center is located in the Northwest area in Jacksonville (an area with some of the highest crime and poverty rates in Jacksonville) and is an outreach hub for Celebration Church. 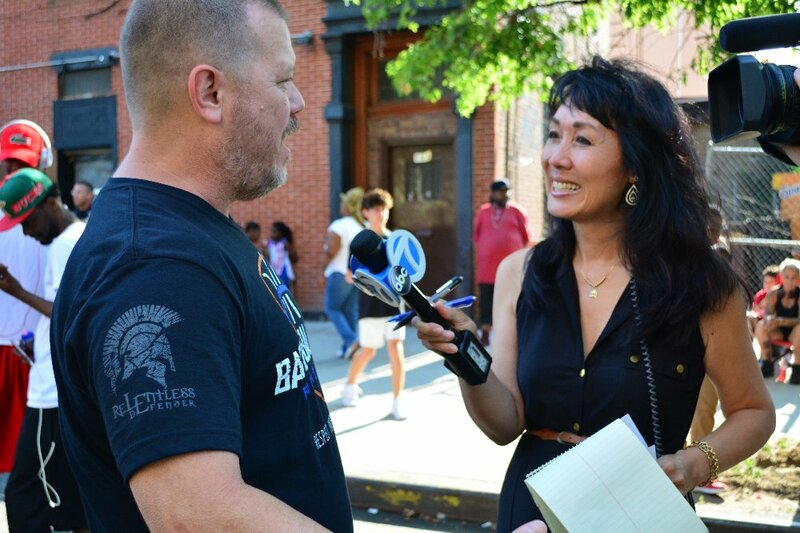 The Dream Center is open throughout the year and hosts various outreaches for the surrounding communities. Some of the Dream Center outreaches include neighborhood block parties, after school programs, summer feeding programs, holiday food drives and more. 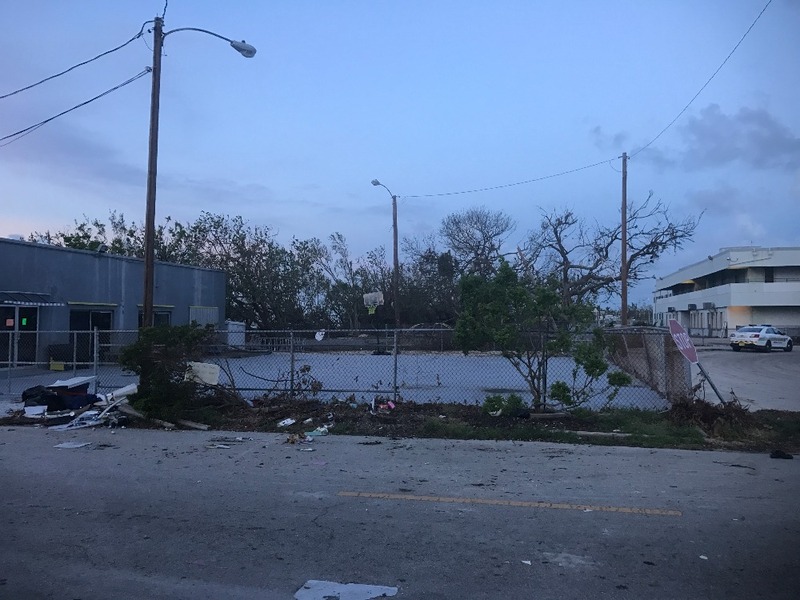 In September of 2017, Hurricane Irma tore through the FL Keys, causing catastrophic damage. Right in the middle of it all was the Marathon Rec Center, which is a non-profit after school program which hosts about 40 kids each day. Like everything else, the Rec Center was damaged by the storm, limiting the amount of outdoor recreation for the kids. On Jan 24th, 2018 we cut the ribbon on our biggest court renovation to date. 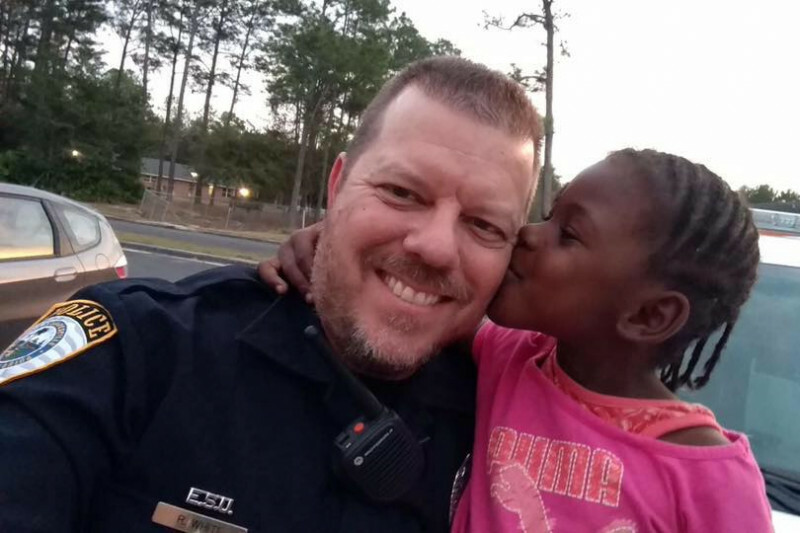 Help us continue to connect cops and kids across the country with a donation today! On September 9th, we were honored to be in the Houston area putting on a BCF event at ReLEntless Defender Apparel HQ. We partnered with Attack Poverty to bring in 30-40 kids from the area who have been flooded out of their homes from Hurricane Harvey and have since been cooped up in hotels and shelters. We had law enforcement officers from several different agencies, including Houston Police Department (Houston Police Department Mounted Patrol), Richmond Police Department, Sugar Land Police Department, and Bellaire-City Police Department, to name a few. The kids got to play basketball with the cops, they watched K9, Mounted Unit, and martial arts demos, played in a bounce house, ate hot dogs, made their own BCF shirts, and all left with a basketball and a RDA/BCF goodie bag. We also had a special visit from Tyler of I DONUT need a reason to THANK a cop. He brought donuts (of course) and goodie bags for the kids! I would like to thank RDA owners Aaron Slater & Danielle Delgado, the RDA Crew, and all of the volunteers who came out to make this special day happen for these kids! We plan on making this an annual event. Harvey is not invited next year!!! 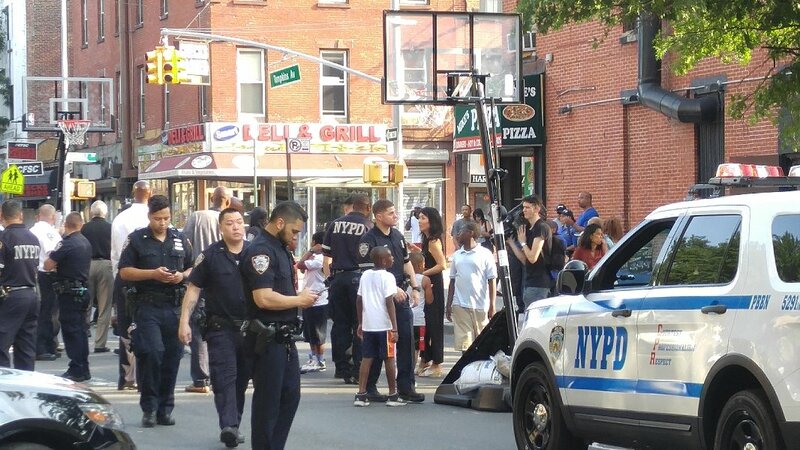 In November of last year, I offered to donate 5 basketball goals and some balls to the NYPD. I was put in touch with Asst Commissioner O'Connor to arrange the delivery. He told me that he had an idea. He said that he wanted to "take over the streets" in 4 different neighborhoods in the NYPD Patrol Borough Brooklyn North area. The planning began. I reached out to my contact at Spalding, who donated 4 goals and 50 balls. I reached out to my contact with the NBA who contacted the Brooklyn Nets, who wanted to play along! After months of planning, we hit the streets of Brooklyn!!! I couldn't have dreamed of the amazing turnout we had. Dozens of officers having a blast with 100's of kids! Thank you to all who contributed to make this idea a reality. This will not be the last time we work with the NYPD!!! What city is next??? Chicago, Detroit, New Orleans, LA???? Please consider a donation today to help us keep bridging the gap between our country's police and the youth in our communities. Palm beach shores, Fl. Just started a week ago. I wish you continued success as you help with this worthy endeavor. What you're doing can help with police departments across the country. Thanks for above and beyond the call of duty! my comment was messed up but to set up tax free here is info Next, complete and submit Form 1023, Application for Recognition of Exemption Under Section 501(c)(3) of the Internal Revenue Code. The information that you include on this form will serve as the basis of the IRS's decision of whether to grant your organization tax-exempt status. I donated buNext, complete and submit Form 1023, Application for Recognition of Exemption Under Section 501(c)(3) of the Internal Revenue Code. The information that you include on this form will serve as the basis of the IRS's decision of whether to grant your organization tax-exempt status.t if he can set up a tax exempt company, he may get more donations. Here is info and good luck. Love this! You’re an inspiration and proof that one person CAN make a difference. Donated in memory of my nephew Andrew for his Birthday.